All cars have been upgraded with kadee couplers, talgo trucks and wheel sets. He was noted for his hand lettering on models (as can be seen on the circus train). New ListingReplacement Add on Pieces Old Sturgis Steamer Train Track 2 Sets 23" and 46"
1- Sinclair Oil Car. 1- Union Pacific Locomotive. All freight cars and the locomotive are most likely used but unsure. ALL ARE UNTESTED AND SOLD AS IS. 1- State of Main Products Car. BOXES ARE NOT PERFECT AS SEEN IN PHOTOS AND MAY BE DUSTY. Lot is as you see here. Buchanan pieces are modular, can be fitted longer or shorter. (Scene Master Life-Like Trains Accessories. But what may appear as excellent to us, may in fact be "good" or "very good" to you. 1) Model Train Smoke. CONDITION: The ahm temp black locomotive does not have a motor and all 3 trains are not running. The pennsylvania car is cracked in the back and by the right side front window.Trains are good for parts and are being sold as is. ASSORTED ACCESSORIES IN VARIOUS SCALES. CONDITION VARIES FROM VERY GOOD CONDITION TO EXCELLENT. WHAT YOU SEE IS WHAT YOU GET. BEING SOLD AS IS SO LOOK AT PICTURES CAREFULLY. 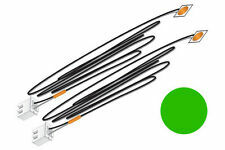 Caboose Ind 5202S HO Ground Throw Sprung (5) | ASAP Hobbies. Caboose Industries 5202S. (2) Hobby Line box cars. (2) Bachmann box cars. (2) unmarked cars. (5) Bachmann Cars in Boxes. Macao Green Engine and Tender. All are complete and in good condition with couplers. 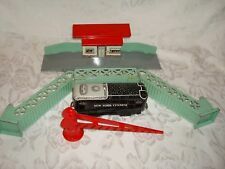 You are bidding on a vintage tyco train mountain. It is in good condition for its age with no cracks in the plastic. If you have any questions feel free to email. 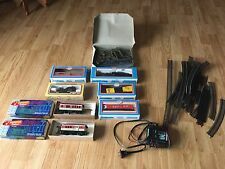 YOU ARE BIDDING ON A MIXED VINTAGE LOT OF LIONEL AND AMERICAN FLYER CARS AND STRUCTURE!!! SEE PHOTOS FOR DETAILS. HAPPY BIDDING!! !...SEE MY OTHER AUCTIONS!!! This is a collection of retro train gear. See pics for condition. Any item may show wear from decades of use/display. Colors may vary from monitor to monitor. Most are intact, but not all. HO Toy Train. We have one of the largest Canadian collection on hand. For sale - Lot of Small Model Train Signs People Building & More. I placed a quarter in a few of the pictures so you can see how big it is in compared to a quarter. Being sold as is. Product Info. 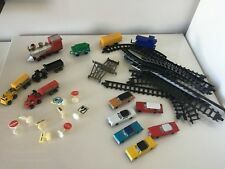 34 pc lot of wooden accessories to play with your wooden train set. Previously owned and played with in good shape. TESTED, plays very well. Condition: VG (moderate scuffing, a few small scratches cause minor ticks, minor rubbing/scuffing to printed titles). Occasionally an ad will have another DIFFERENT ad on the back or reverse side. If not indicated in the title, the pictures will make it obvious. AD ON REVERSE ?. I have listed 100s of color newspaper ads from the 1920s to 1950s. VINTAGE LOT OF N-SCALE TRAIN CARS (14) Extra Wheels - BACHMAN ATLAS ETC. What you see. Most is in like new condition. One smoke tube sealed, other near full. COMMIT TO BUY " button. New ListingThe Cats Meow village Lionel 6 pcs The General wooden set in box. This doesn't appear to work on Smart Phones and tablets. Trains are being sold as is. from the files of a newspaper, will have expected markings on back (in varying degrees) associated with newspaper use and publication, may also have markings on the front such as hand touchup, highlighting or crop marks typical of newspaper industry used photos kid in the photo is Gerard McGovern age 10, NYC Toy Guidance Exhibit, shows a variety of space toys from several different companies . The boxes are in various conditions. Assorted HO Trains And Track. Condition is Used. Shipped with USPS First Class Package. Don’t know much about these locomotives. Box cars are missing parts. Check pictures for details. PAINT HAS SETTLED AND WILL HAVE TO BE MIXED WELL BEFORE USING. I'VE DECIDED TO CLOSE THE DOORS TO THE PUBLIC AND JUST CONTINUE SALES ON THE INTERNET. Would make a good restoration project.